New information about details of attack which killed four tourists at the Taba border crossing between Egypt and Israel. 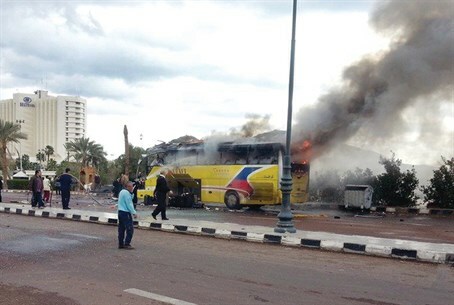 Security sources have confirmed that the explosion on the Egyptian side of the Taba crossing on Sunday was carried out by a suicide bomber. Four civilians were killed and 15 were injured in the incident. A fifth body, that of the suicide bomber who set off the explosion, was also found in the rubble. According to investigators, the terrorist set off the bomb when the bus was just a few meters from the crossing into Israel through the Taba gate crossing. The bus was to have continued on to the southern Israeli resort city of Eilat. The driver got off the bus to arrange paperwork with border guards when an unidentified man approached the vehicle and blew himself up, witnesses said. Two of the dead passengers were South Korean citizens. South Korea immediately issued a travel ban for the Sinai region in response. In a statement, Seoul's Foreign Ministry said that the government was “are shocked and enraged at the terrorist bombing on the bus... and strongly condemns the act. We believe that terrorism can never be justified under any circumstances and such inhumane and unethical acts should be weeded-out by all means," the ministry added. An Al Qaeda-inspired group, Ansar Bayt al-Maqdis claimed responsibility for the attack, and released a statement on Twitter vowing to continue its fight against Egypt's military-led government. "We will continue to hurt the leaders in Egypt, the economy, the tourism and the gas," the statement read. Meanwhile, on Sunday night, reports said that there had been a shootout between Egyptian security forces in the Alexandria area and a group that had attempted to take over a police station. The group was apparently hoping to free several terrorists who were imprisoned there. It was one of many attacks on the Egyptian security forces, which have increased significantly since the Egyptian army deposed former President Mohammed Morsi last year and declared the Muslim Brotherhood illegal.